The Low Noise Model 2010 DMM offers production test system integrators a wide range of advantages, many of them unavailable even in other Series 2000 meters. The 2010 combines high resolution with the high speed and accuracy needed for production applications such as testing sensors, transducers, A/D and D/A converters, regulators, references, connectors, switches and relays. It’s equally well-suited for testing subassembly or system level electronics. 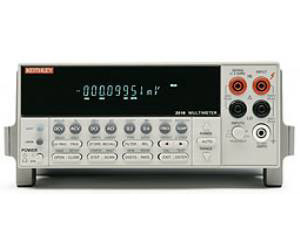 The Model 2010’s low noise floor (just 100nV) allows more accurate millivolt- and microvolt-level measurements. Additional advantages include high DCV basic accuracy (7ppm), stability, and linearity (±2ppm of reading + 1ppm of range on the 10VDC range) to reduce total measurement uncertainty. A wide dynamic range minimizes range-shift errors and speeds systems applications by reducing range change delays. The built-in ratio measurement function simplifies precise relative measurements and comparison testing. With speeds up to 2000 readings/second, it also provides the high test throughput required in production applications.